Prestashop Marketplace Seller Statistics : Now you can analyze each and every activity of the customers on your eshop. By viewing the key statistics, you can get better tips on how to increase the visibility and promote the products of your shop. 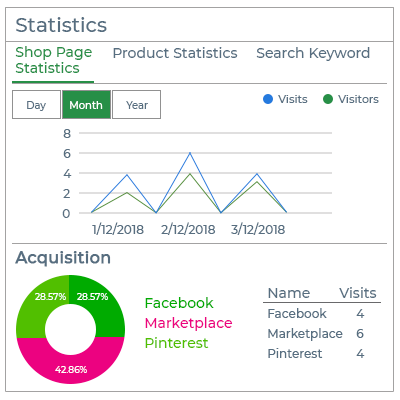 Prestashop Marketplace Seller Statistics - Now you can analyze each and every activity of the customers on your e-shop. By viewing the key statistics, you can get better tips on how to increase the visibility and promote the products of your shop. View the number of visitors and visits on your shop page and products. View channels from which the customers have visited your shop or products will help you in making the promotional strategy. Get optimization tips to increase the visibility of your shop by viewing the keywords that are used for search on the marketplace. Keeps your users more engaged on the store by loading more products every time they scroll down. View the total number of visitors and visits on your shop country wise. Sellers can get information on the visitors and number of visits done on their shop and product pages. Develop a better marketing strategy by viewing the channels through which traffic is coming to the store. Knowing the location of users will help the sellers in creating targeted campaigns for that location. Sellers can analyze the demand for a product by viewing the number of visits done on their product pages. 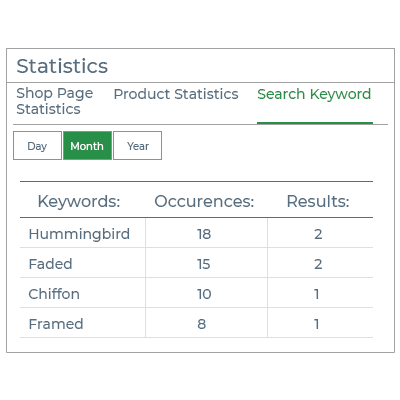 Sellers can view the keywords that are being used while searching for the products on the store. By adding the keywords to the product description or features that are frequently used by the users for search will help in increasing the visibility of the products. Did you buy Prestashop Marketplace Seller Statistics?